LONDON--(BUSINESS WIRE)--Technavio analysts forecast the global electric shaver market to grow at a CAGR of almost 4% during the forecast period, according to their latest report. The research study covers the present scenario and growth prospects of the global electric shaver market for 2017-2021. 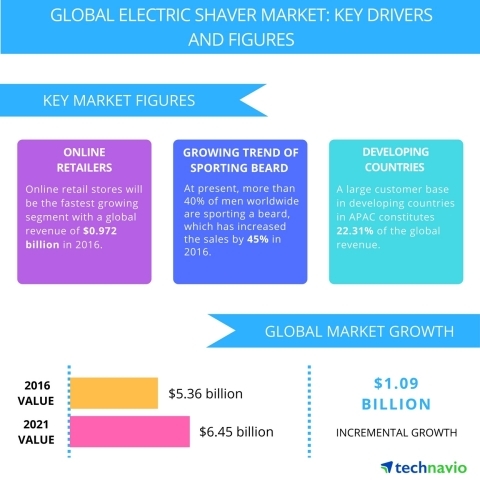 To calculate the market size, Technavio analysts use the revenue generated from the retail sale of electric shavers. The global electric shaver market is driven by the rising focus on personal grooming. The emphasis on clean-shaven look among men in urban areas and body hair removal among women is increasing the demand for electric shavers across the globe. The demand mainly arises from developed regions such as Europe and North America due to the wide acceptability of the product. However, the product is also gaining acceptance in other regions of the world with the increase in marketing activities by vendors and availability through online channels. The transformation in the socio-economic scenario in major countries such as the US and the UK has led to an evolution in the concepts of beauty, wellness, and grooming. These ideas, which were traditionally considered female-centric, are becoming increasingly gender-neutral. People have become more confident about embracing their individuality. The millennials are less confined by traditional gender roles and conventional norms. China and India are populous countries with a population of 1.37 billion and 1.25 billion, respectively, in 2013. This has created a large customer base for male grooming products such as electric shavers. The millennial generation drives the growth of this market. In 2016, there were 385 million millennials in China, constituting more than 25% of the total population. The growing appearance conscious millennial generation, along with rising disposable income, has increased the demand for electric shavers. “Social media is one of the major influencers for millennials in terms of fashion and grooming. More than 50% of the millennial population in China and India are active social media users. Thus, an increase in marketing through social media is not only creating awareness among consumers but also persuading them to use grooming products for enhancing appearance,” adds Amber. Non-electric shavers have been in the market for a long time. However, they are increasingly replaced by electric shavers due to their advantages. Ease of use coupled with fast and effective results are some of the most important growth factors for electric shavers. They provide increased comfort and convenience while shaving since most products have flexible heads that can easily follow the contours of the face. A quality electric shaver causes little or no skin irritation and no bleeding during close shave, unlike razor blades. Products of well-established brands like Panasonic, Remington, Philips, and P&G are helping in achieving the desired results. With the pain of waxing and the unpleasant odor of hair removal creams, consumers are opting for electric shavers, which provide an easy option for removal of unwanted hair. Become a Technavio Insights member and access all three of these reports for a fraction of their original cost. As a Technavio Insights member, you will have immediate access to new reports as they’re published in addition to all 6,000+ existing reports covering segments like agricultural equipment, lab equipment, and outdoor gear. This subscription nets you thousands in savings, while staying connected to Technavio’s constant transforming research library, helping you make informed business decisions more efficiently. Technavio analysts forecast the global electric shaver market to grow at a CAGR of almost 4% during the forecast period, according to their latest report.